Versioning of client apps and servers in sync can be problematic. This is particularly true for smart client scenarios, especially mobile clients (where deployment may occur over time due to Apple/Google/Microsoft stores). And that's fine - that's what I've been recommending people do for years. And that's OK in some cases. But in other cases it would be far better to have a single public endpoint for all client devices to invoke, and then that endpoint could route calls to non-public versioned endpoints. This is particularly beneficial in a Docker/Kubernetes scenario, where the public endpoint is defined as a K8s service and has public security and configuration, while the K8s cluster runs n appserver-v1 and appserver-v2 instances based on load - but without the public security/configuration concerns. 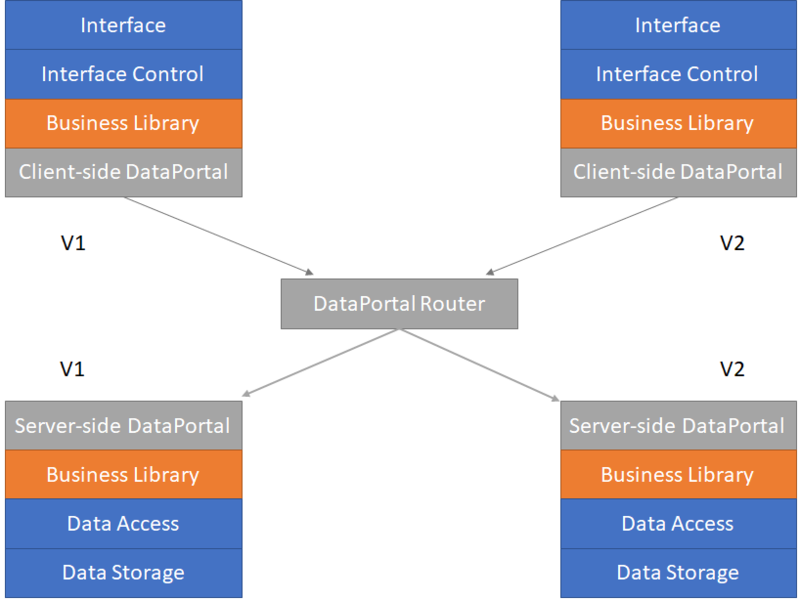 Either way, what's needed is a data portal router component that exposes the public endpoint and routes each call to an appropriate private server endpoint. My plan is to implement this only for the HttpProxy/Host channel, because I can do that without deserializing/reserializing the message payload on the router (I don't see how to avoid that with WCF...). It should be possible to add a version element to the payload sent from the client-side dataportal to the server, right alongside the serialized object graph. That version element can be used to route the call, with minimal overhead, to the version-specific private server endpoint. This is now implemented for HttpProxy and the .NET Core Http data portal controller. The scope of the change has changed somewhat. As per the original request it does handle routing based on app version. 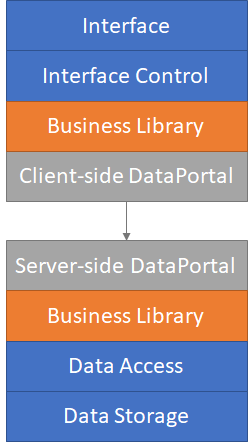 However, it now also allows per-type routing so data portal operations for specific root domain types can be routed to specific servers in a cluster. There is now an ApplicationContext.VersionRoutingTag property (which can be set via config with override at runtime) that you should use to specify the version of your app. This is an arbitrary string (that can't contain '-' or '/'). There is now a DataPortalServerRoutingTag attribute you can apply to a class or interface. This allows you to attach an arbitrary routing tag string (that can't contain '-' or '/') to a specific type. In the server-side HttpPortalController constructor you must load a dictionary with key-value pairs to route calls based on these tags.